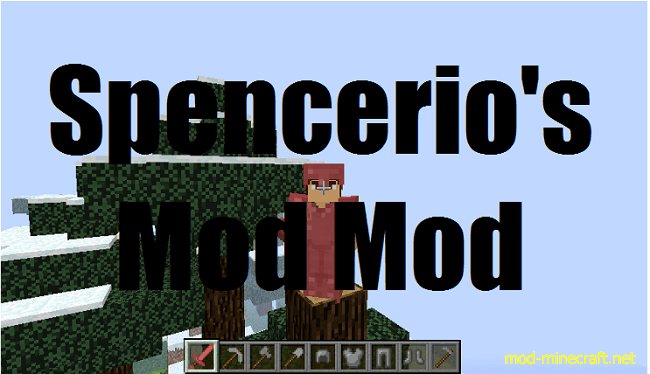 Spencerio’s Mod Mod is a mod with the hope of making Minecraft much more rewarding again, as well as add in some really cool stuff that is challenging to get but whose rewards are awesome (such as the Customizable and Boss Spawners, whose recipes are extraordinarily expensive but allow you to spawn any mob in the game, including long-lost GIANTS, without any cheats)! Right now it adds loads of ores, tools, armor, and ingots/drops, and adds craftable spawn eggs and craftable music discs into the game, as well as a new type of dungeon, a Help Block and Help Block GUI, and much more, such as a few flowers and the best stuff added, in my opinion: the Customizable Spawner and Boss Spawner. You can even spawn Giants from long-lost Minecraft with the Customizable Spawner, as well as spawn the bosses using the Boss Spawner! Go to start menu, then type %appdata%, click on Roaming, go into .minecraft, and open your mods folder (if you don’t have a mods folder in .minecraft, make one, and be sure that the folder ?mods? doesn’t have ANY caps in its name). Put the mod’s .zip or .jar file into the mods folder. Run the new launcher, select the Forge profile, then play.